The 21st century enterprise generates humongous amount of data and this data is stored in disparate enterprise applications – ESS, Productivity, LOB ERP etc. In addition to this, over the past few years, there has been a tremendous influx of new SaaS and productivity applications. Since these tools are cost-effective and solved key business challenges and thereby received high adoption among organizations. With the advent of new technologies like IoT, the enterprise data is set to bolster in the coming years. Even though these new systems are driving/set to drive business efficiencies, they have brought in a new problem for enterprises – Data Fragmentation. According to McKinsey, The average interaction worker spends nearly 20 percent of the workweek looking for internal information or tracking down colleagues who can help with specific tasks. Employees today have to switch between multiple data-points across systems to get a 360-degree view of reality during decision-making in order to get tasks done. There are several applications within an enterprise with stand-alone search options. Before delving into why enterprise search matters now more than ever, it’s imperative to understand why people search. Say you are creating a proposal for a new prospect. Needless to say, creating proposals require information from a variety of sources. This includes inputs from your technical team, financial elements, customer references, testimonials, case studies and what not. And all this data won’t be available in a single system. You have to manually switch multiple applications and search to unify the scattered information. Let’s say a new employee joined your company and the candidate wants to apply for leave. Since the candidate is a new entrant, he/she might not be aware of which application to use to apply for leave and has to go around asking other employees for help. Let’s consider another scenario – You need to find a document say a customer’s contract. Your first logical thought will be searching in the CRM say Salesforce. If you couldn’t find the document in Salesforce you might think “Ah, it should be available in the Dropbox” and continue your search. If you still couldn’t find the document, you will ping your colleague for instructions – who will typically repeat the same steps again, fails and reaches out to someone else. This process happens multiple times a day throughout the organization decreasing the overall productivity. Whether it’s a personal decision or team decision or a strategic decision, employees need a big picture view of reality while decision-making. Getting insights from different sources helps them in increasing the decision-making accuracy and make better decisions. And these insights can’t come from one single application. These are the three important reasons why employees search and the presence of stand-alone search for each application heavily decreases their productivity. The hassle and time involved in data discovery hinder decision makers from making completely data-driven decisions. This lack of a single search option also tends to diminish employee productivity, because of the time and effort spent in finding required information. Enterprise search acts a single window view of all the enterprise data. It acts as an instinctive single point of contact for employees for all their information accession needs. In an effort to ensure that employees are fully utilizing the intranet to access personalized information and to do it within minutes, forward-thinking organizations are quickly implementing enterprise search into their intranets. Employees have to face the hassle of switching between different apps to get the information they require. With enterprise search, documents can be accessed easily from a single window and thereby enable a faster-decision-making process. Implementing enterprise search also simplifies employee onboarding, and creates a smooth experience for new employees. All information regarding procedures and policies related to leave applications, company policies, compensation, benefits, safety, performance, and others, can easily be accessed via a simple search, instead of having to depend on the HR department or other colleagues. Enterprise search in an intranet makes the intranet a go-to place for employees to discover new information, get tasks done and allows them to be more productive. As a result, employees use the intranet more often, boosting the adoption rates. Integration of enterprise search in an intranet enables employees to research data, collaborate with team members, generate new ideas, obtain company updates and alerts all from one location. Contrary to the popular perception, the interface of an enterprise search is not limited to a web interface. At Acuvate, we built an intranet chatbot – MeshBOT, which allows you to get information from the intranet through natural language questions. If the answer is too complex to be given in a chat interface, the bot will provide the link to the relevant dashboard. 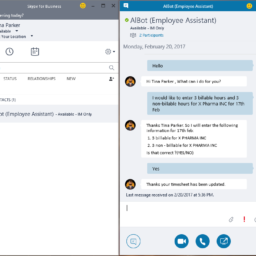 your messaging application like Skype for Business, Skype, Slack etc. Another interface is a voice-enabled assistant like Cortana or Alexa. We support chatbot integration for these channels as well. MeshBOT and enterprise search are also a part of our AI-Powered intelligent intranet Mesh. More interesting features of Mesh can be seen here.